Today I woke up and decided to be extra lazy, I flopped around for a bit and headed down to breakfast with Justin. We loaded up on all the delicious things and then went back upstairs to do some work for an hour or so. 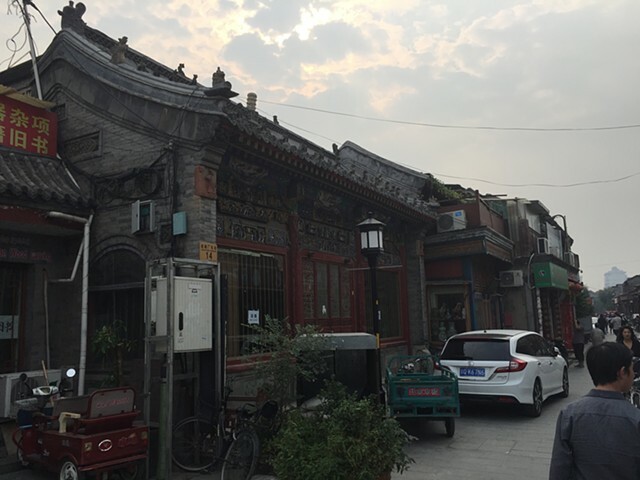 I headed out to Yangmeizhu to check out the hutongs and met up with Justin who had just run into Eugenia, Ida and Qino by coincidence. Justin and I wandered around for a bit and stopped to get some legendary Peking Duck at a small restaurant on a street full of small restaurants. It’s crazy how much the atmospheres change from one street to the next, there’ll be big glitzy designer stores and a few metres behind there’ll be laneways full of tiny roast duck restaurants, fruit and vege shops, kids, scooters and heaps of people bustling around. From where I was sitting in the restaurant I could see a very plump man shaving in the kitchen with his shirt off. After lunch we checked out a few more shops, bought a few shiny things and grabbed a coffee. We were getting a bit stompy by now so we headed back to the hotel. I decided to stay in tonight and Justin has headed out for dinner and some much needed partying after hanging out with this old fella all day. Tonight I’ve been writing and planning, keeping up with the real world and missing home a little. Dead Centre, a show that Anna and I curated at Spectrum Project Space back in Perth opened tonight and I’m waiting to chat to Anna about how it all went. I went for a bit of a stroll to get some dinner in the hutongs behind the hotel. It’s such a strange contrast walking out of this giant hotel and just around the corner the world becomes filled with tiny single storey rambling buildings filled with little shops, mechanics and restaurants. Sometimes you can see straight into a tiny bedroom with bunches of kids watching TV. Everybody is glued to their phones no matter where you go, it’s much more of a constant aspect of life here, WeChat is pretty much the entire universe and it seems to work just fine. Right now I’m taking a break to watch some wheelchair fencing on TV because it looks awesome. I can hear a constant chorus of horns and traffic from below and I’m looking forward to getting back to Shen’s tomorrow. Beijing is an amazing place but I need a little break again.